20161119 - Up in the am to a quite house with the 2 big boys gone. I had to get some things done at the desk and eventually G&I headed out on some errands. 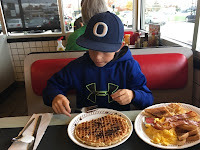 First stop was Waffle House for a huge meal. Then we hit the gas station to get a lotto ticket for the next month. On to Goodwill looking for book I donated and now need... Kroger to get bags for the awards tonight. Home and took stack of stuff to basement to work on while we watched the Buckeye game. Got flyers and awards ready for tonight. Set up Paypal for the troop to collect wreath $ this year. We then got bundled up and headed to the Boy Scout Thanksgiving Dinner and Annual COurt of Honor. We had a good meal and weren't to cold. It was a nice Court of Honor and some good speeches were given. We got some extra supplies to D&J and headed home in good time. We settled into the basement to watch some more college football and I worked on stack of stuff until 2am. G watching (sleeping) college football with me.